After my experiences in Phnom Penh and my adventures in Siem Reap, a crossroads lay before me. My original party of five had dispersed. One pair returned to Sai Gon, where they would spend their remaining days in Southeast Asia during Tet Holiday, then head back home to New York. The other pair were headed north, to Laos. I had no particular inclination to go in either direction. Thus the opportunity arose where I instead head east – to Thailand. This would not be my first time venturing into the Land of the Thais, as some months ago I paid a visit to Chiang Mai to meet an old friend. This time in Thailand, my time would be spent in the mad city of Bangkok, a place legendary for things those of us in the West use as the fodder for juvenile puns and crude jokes. I can assure you that much of what you have heard about Bangkok is probably true. I spent less than a week there, with the intentions of meeting another (different) friend of mine, and as it turned out I got there early, and had about two full days of free time to myself before their arrival. This left me with ample opportunities to sample the cuisine at my own pace. And yet, while hoping to enjoy Pad Thai the way I keep expecting it to taste, I was once again disappointed. To understand Bangkok – I don’t claim to except superficially, as a tourist – one must first take the phrase “East Meets West” and take it a step further. Thailand is a fascinating blend of Indian and (South)East-Asian influences. There were many empires (of which Angkor Wat stands as a remnant) to attest to the rich history of this part of the world. Yet, when we say East Meets West, we often think of the Crusades in the poorly named “Middle East,” or perhaps those wondrous melting-pot cities like Jerusalem and Istanbul. Though I recently read the opinion of a rather prolific traveler in regards to how culturally diverse the Dubai airport is. Bangkok is no exception, and the phrase “East Greets West” feels more apropos. 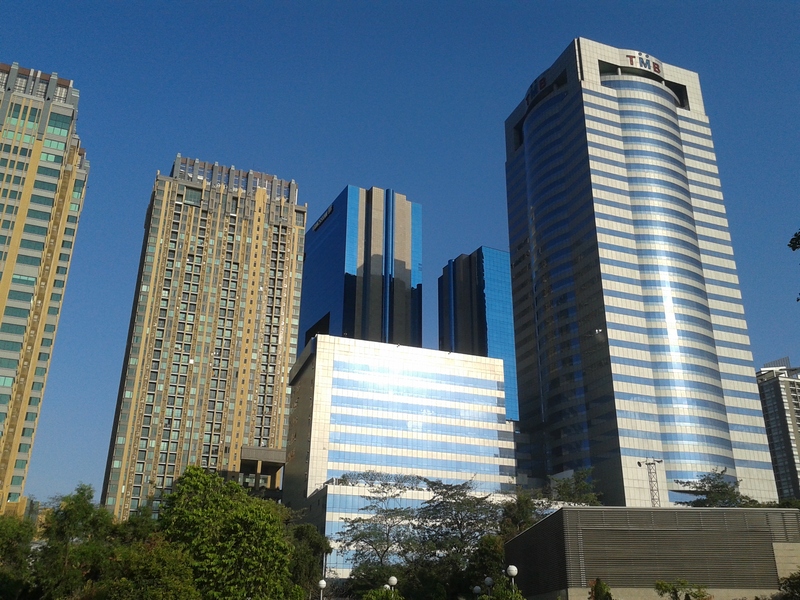 Thailand is a highly developed country and it shows in the capital city. I won’t spend time here contrasting to Viet Nam, or Thailand’s little brother Cambodia, as the socio-political intricacies require a degree of precision in history such as I am – currently – incapable of providing in a clear and unbiased context. Suffice it to say that Thailand opened its gates to the outside world long ago, and has prospered as a direct result. While still retaining aspects of its cultural identity, I could not help but see incredible levels of globalization in Bangkok. Modernity with a dash of camouflage. It is an interesting discussion about how the more “developed” a country becomes, the more “Western” it appears to be, from the fashion trends, to infrastructure, and sometimes even aspects of the government (more on Thai administration later). But it is profoundly Western-centric of me to assume anything along the lines of other cultures wearing skinny jeans or dying their hair as an attempt to “look more Western.” This is a debate the likes of which I’ve participated many times in the past, and have since come to adopt the opinion that it isn’t “Western” style (whatever that is) that we see around the world, but more of a global style, usually accompanied by individual cultural flavors. Thailand has no shortage of flavors of its own, and I saw this first hand in Bangkok. The people — while predominantly (assumedly) Thai, are extremely diverse among themselves. This city is, during my limited globe-trotting experience, the very definition of cosmopolitan and metropolitan. In fact it was very reminiscent of Manhattan. Which is probably why I’ve since decided I don’t like it there. Cosmopolitan and metropolitan are noble words to have ascribed to a city, but not my kind of city. Although while I compare Bangkok to Manhattan, I believe that Bangkok is significantly more globally-minded. 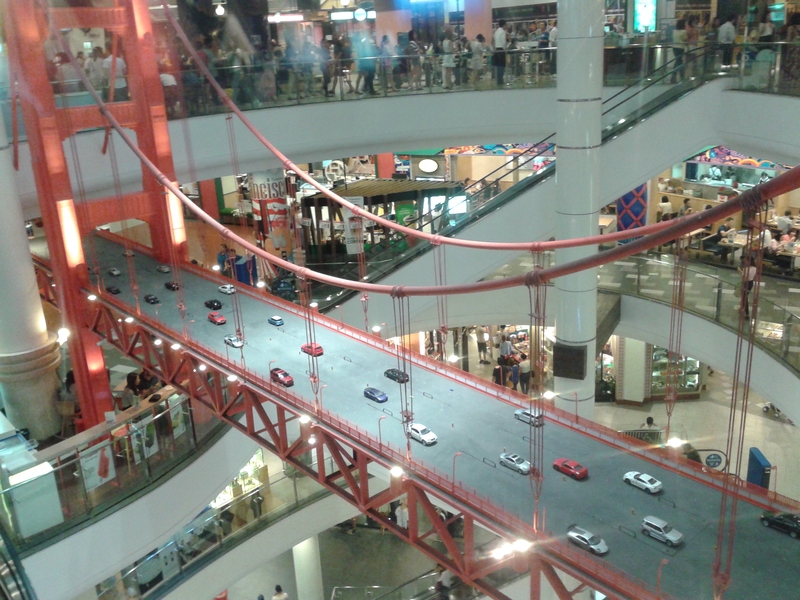 This could be seen in, of all things, some of its most prestigious landmarks: the shopping malls. 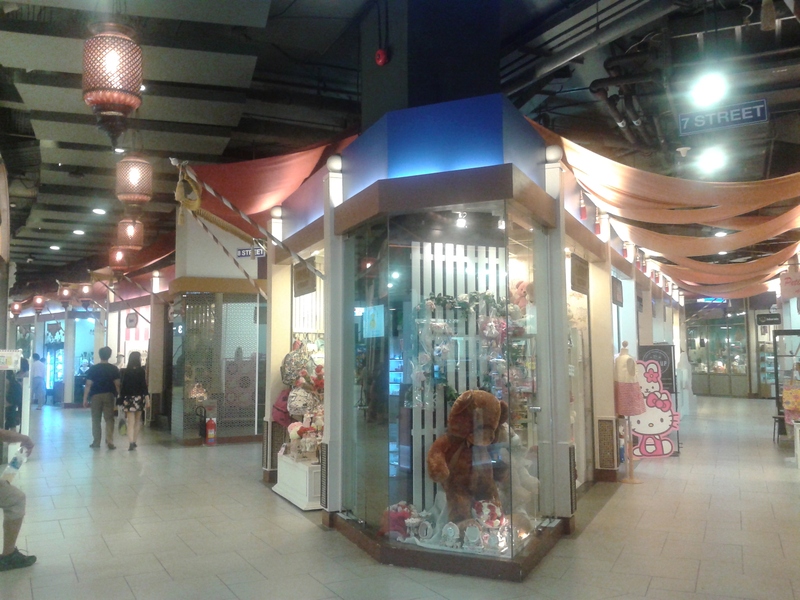 This is probably the only shopping mall – styled after an oldschool market – that I actually didn’t mind checking out. 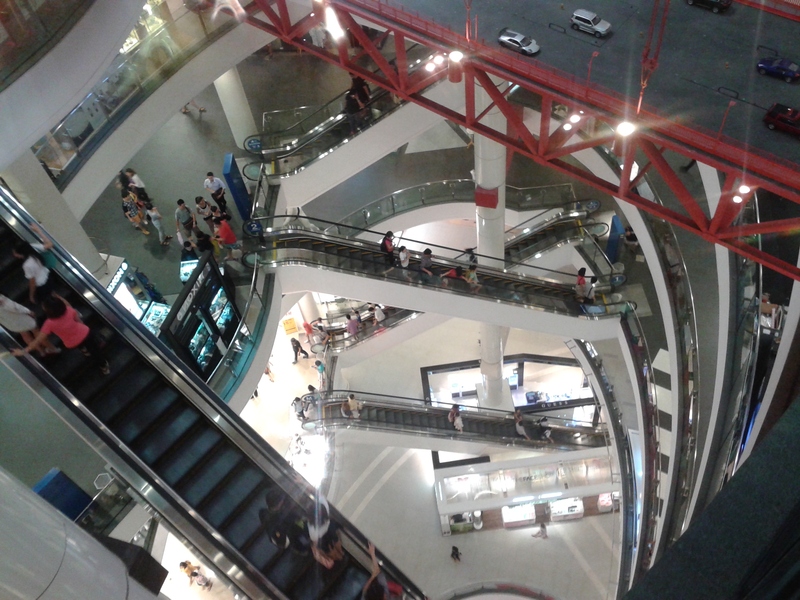 The people of Bangkok – Bangkokese? Bangkokers? Bangkokians? – appear to be largely more concerned with keeping up with fashion trends and expressing their individuality. I was, of course, spending a lot of time in the direct city center where shopping malls stood as legit tourist attractions as much as actual shopping centers, and the mighty Terminal 21 – a mall designed to resemble an airport, which each floor having a different theme based on various interesting cities around the world. Istanbul, Tokyo, San Francisco and Paris come to mind. Not to mention it was the Lunar New Year, so they had a bit of a China theme happening. 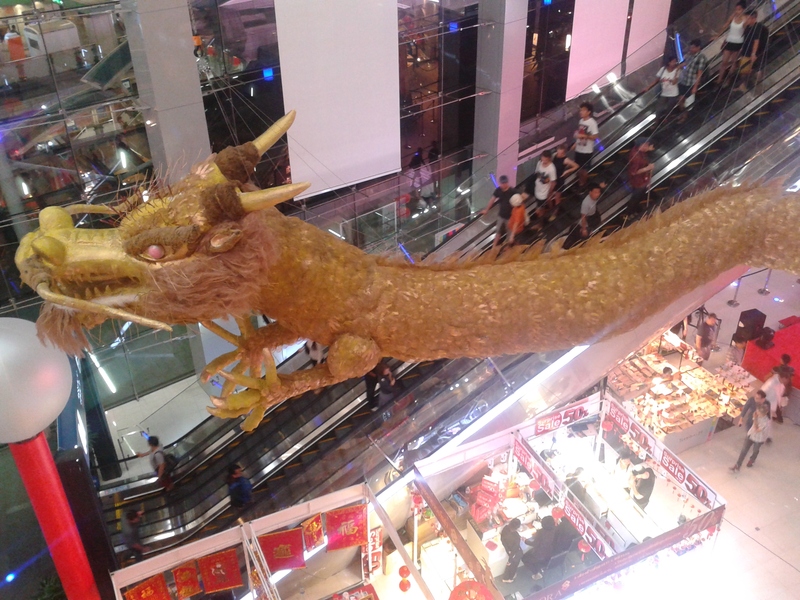 No shopping mall is complete without a giant golden dragon. Thailand, with the evident desire for self-expression and individuality in its inhabitants, makes for what I can only assume is a very open-minded community. I saw just as many Thais walking around with dyed hair as those who kept their hair black. There were piercings, tattoos, and quite a bit of androgyny about in terms of dress. These things did not come as a shock by any means, but they did stand in stark contrast to my experiences in Viet Nam where, much like the East-Asian neighbors of Japan, China, and S. Korea, conformity is, expectedly, the norm. And then, of course, there are the ladyboys. Soi Cowboy, practically around the corner from my hostel and a stone’s throw away from Terminal 21 shopping mall. 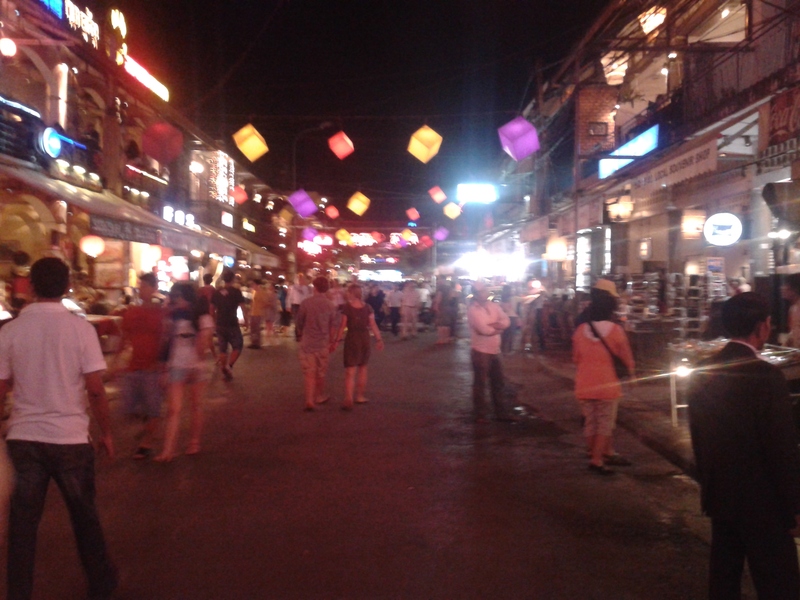 Even as a backpacker tourist, I managed to avoid the famous Khaosan Road, though I now wish I had passed through it at least once. I feel as though I haven’t missed all that much though; the more seasoned travelers, backpackers and expats alike, tend to avoid these tourist havens. They are exactly what it sounds like, and exactly what you’ve heard about. And no, sorry, no pictures. You can look that up on your own. 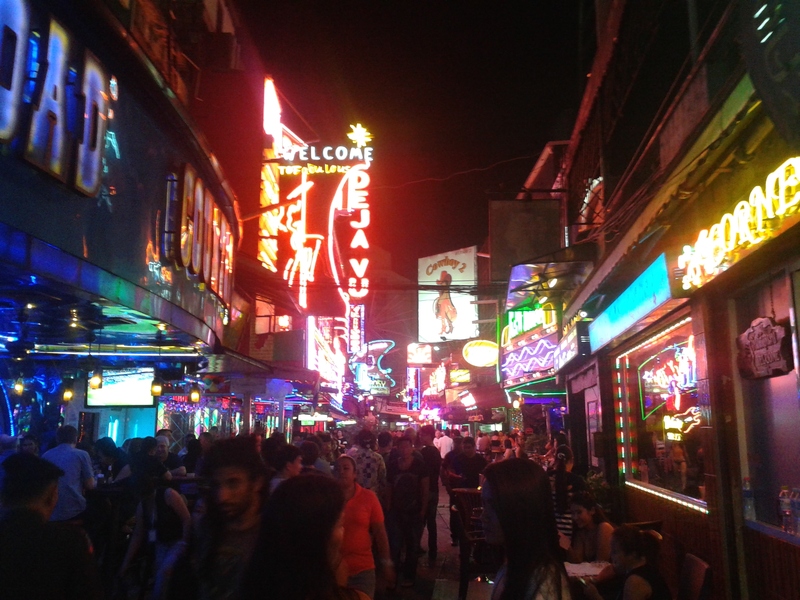 Nothing compares to walking down Soi Cowboy, that mad carnival of a street, and being hawked by gaggles of sexily-dressed waitresses and gangs ladyboy prostitutes. I learned after having stayed there for a night that the area in which my hostel was apparently smack-dab in the middle of what I can only respectfully call a huge prostitute zone. And after a few days of sight-seeing, I found myself starting to look at all this and regard it as normal. It is true that prostitution is a viable career path in Thailand, and as such it’s kind of a big reason for tourism. Furthermore, I expect it’s difficult for people to explain to their friends and family that no, in fact, that isn’t the reason they’re visiting Thailand. At any rate, it was a fascinating thing to see the fusion of traditional spirituality and fast-paced commercialism. What I can only describe as open-mindedness towards self-expression and sexuality was apparent wherever I turned. Women dressed like men, men dressed like women, and loads of people dressed like neither – who also happened to be equipped with similarly androgynous faces, leaving my subconscious labeling system as “person” rather than man or woman. I suspect the LGBT community is big there. And there are, of course, many other wonderful things to be found here. 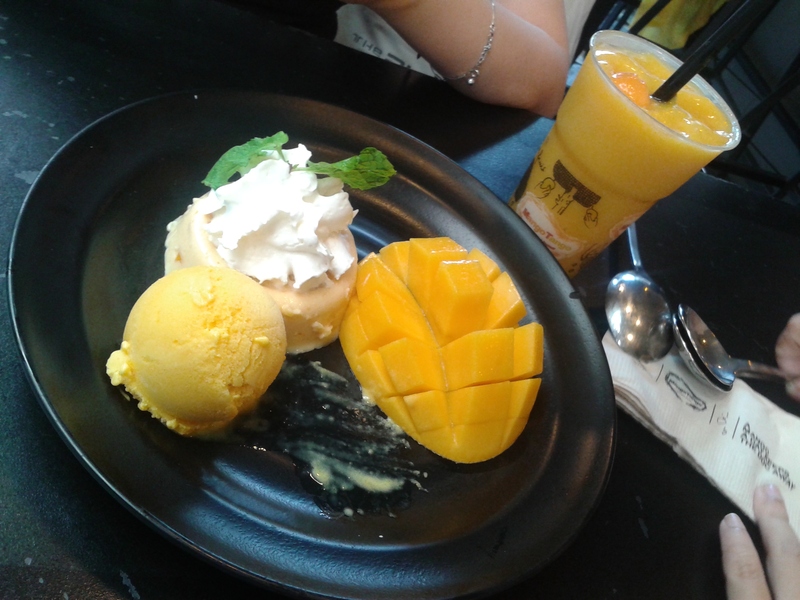 Mango pudding, mango ice sherbet, mango smoothie, and, of course, a sliced ripe mango. The gods are not so cruel. There will be many pictures in this post. 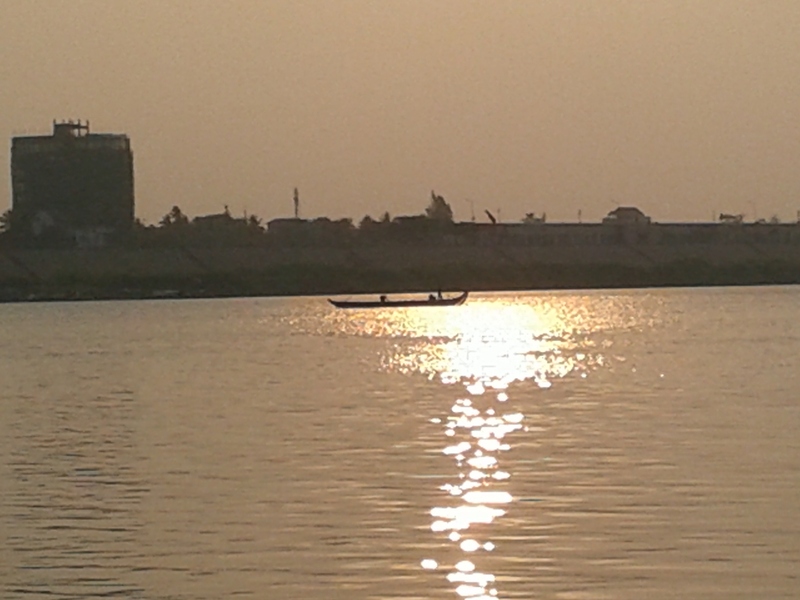 Phnom Penh left its impressions. Imagery and emotional shadows that I will never forget. And that was but the start of our journey. 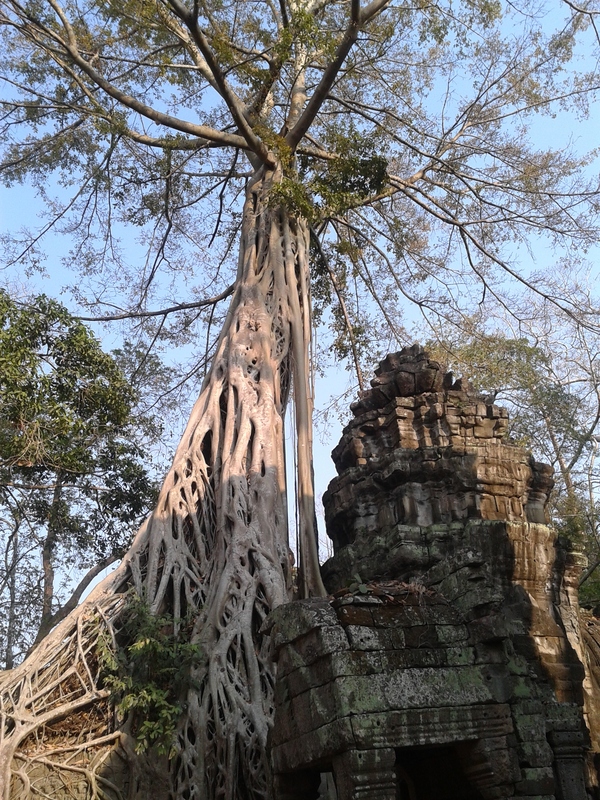 Most visitors to Cambodia go for the star event, Angkor Wat. My party and I were no exception, and there was no denying that that was the prime reason for going to Cambodia in the first place. 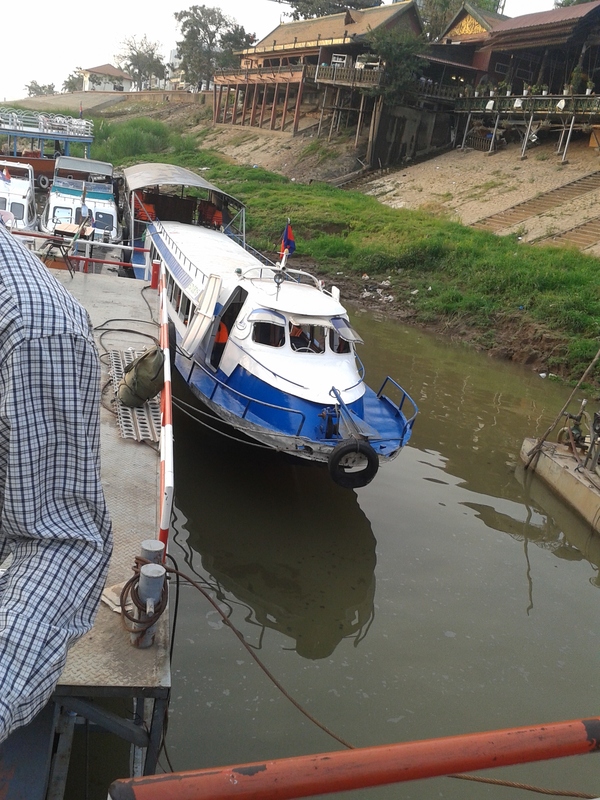 Things began early in the morning, and as per the adventurous insistence of the Thorneater, we chartered a boat that would take us from Phnom Penh to Siem Reap, rather than go the conventional way – by bus. Early in the morning, earlier than lazy people like me have any business being up. In fact I had just gotten over a nasty upset stomach, which the previous night had me afraid I would be missing out on the remainder of the trip. Thanks perhaps to the power of garlic bread, I survived. Our boat, long and thin, was not what we expected. The dock had a number of boats, and we found ourselves eyeballing one of the larger Louisiana-styled riverboats. But then, after waiting around a bit and fruitlessly looking for something to eat, we found ourselves directed to a smaller, albeit no-less charming little boat with ample seats. As we boarded, I noticed the luggage of fellow travelers being strapped to the roof. Some foreign travelers opted to sit upon the roof along with it, and my party and I followed suite. In the distance I could see early-risen fisherman at work in the Ton Le Sap river. The day started cool, but soon warmed as the sun climbed. The boat’s motor started, so loud that only higher frequencies in my companions’ voices could be heard. It sounded like everyone had inhaled a balloon full of helium. With little more than a chrome rail to hold onto, the boat took off, and seeing as no one was asked to please take a seat within the boat, we stayed atop it and enjoyed the view. 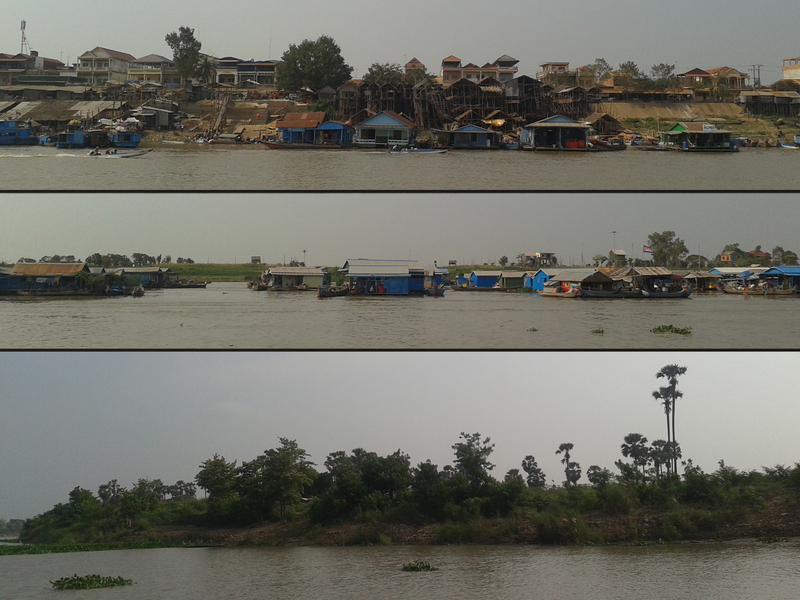 As we sped north, we eventually left the stretches of Phnom Penh, and urban sprawl on either side of the river gave way to floating shanty villages. The further we went, the more often we saw solitary stilt homes, fishermen casting nets, and floating houses lashed together with ropes and empty-plastic-bottle buoys. Most memorable of this part of the trip, however, was the people who waved at us as we passed. Adults, children, and sometimes even other tourists. As I admire the palms and stilt-huts, I cannot help but wonder whether the Cambodians, those along this river as well some we had met in Phnom Penh, are genuinely happy to wave and smile, or there’s some sort of agenda running in these SouthEast Asian countries. I can only imagine that board meeting. Later, when expressing this thought to Thorneater, we realized we each had the same thought. We wondered whether the parents trained their children, or if there was some sort of secret government conspiracy or program at work, geared towards putting a smiling face on every civilian whenever a foreigner passes by. Riverside sights. There was a whole of empty river banks, too, as well endless horizon once we hit th Ton Le Lake. Eventually we landed in a small town just outside of Siem Reap, where a prearranged tuk-tuk awaited our party. And then we spent a night at the hotel, as was arranged by our previous host. Siem Reap is a mad place. If you have any experience in Sài Gòn, it would be comparable to Bui Vien Street; if you have any experience in Bangkok, it would be comparable to Khao San Road. If none of these names mean anything to you, allow me to paint you a picture. To understand these various tourist hotspots, one must delve into a realm of lawlessness that can best be compared to the American Wild West. Drugs are prevalent and prostitution is (as I understand it) illegal but in common use. What all these places have in common is a crowd, and subsequent atmosphere, bent on indulgence. People traveling across the world to indulge themselves, and people who live here providing the indulgences. It’s really not my kind of scene, but it is worth seeing at least once. Pub Street. A bit more straight-forward in it’s naming as opposed to Bangkok’s Soi Cowboy or Khao San Road, or Sài Gòn’s Bùi Viện or Phạm Ngũ Lão streets. 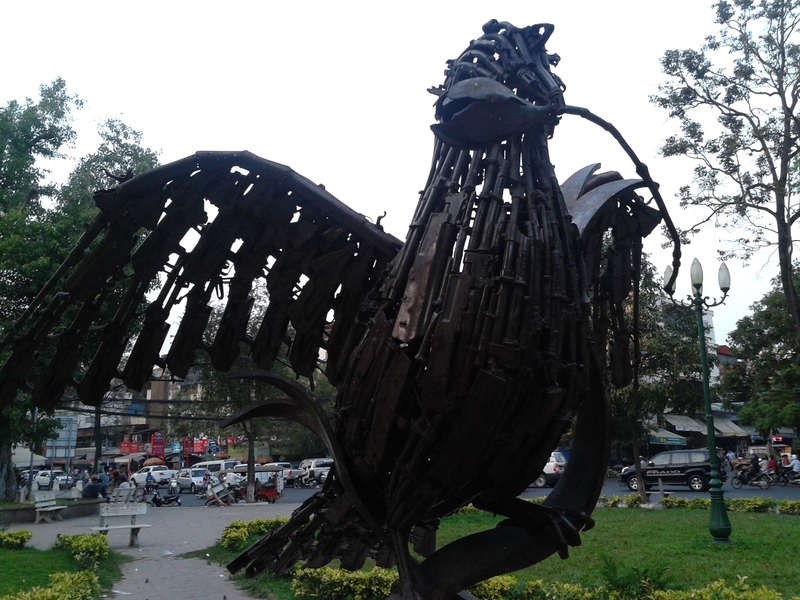 What makes this city really significant, as in for the good reasons, is it’s proximity to one of the most significant locations in Southeast Asia. The fortress temple ruins of Angkor Wat. My party and I rented bicycles. We left before mid-day. Siem Reap has a tuk-tuk madness to it that any cyclist unfamiliar with the rigors of peddling in traffic would find daunting. Yet once broken free of the dusty roads of the main town — and cycling is a most excellent means of transport even if for the sole effectiveness of making the rider tuk-tuk-proof — we made our way north, along one of several main roads, only to find out that tickets were needed in advance. This is the face of a man clearly in control of his destiny. Also, this is the part where I recommend you play this music as you continue reading. Regrettably, I came to realize that my enjoyment of experiencing Angkor Wat was directly proportional to the agony of the intense sunburns I acquired from the boat ride. The fortress temple city of Angkor Wat (“Capital Temple”). 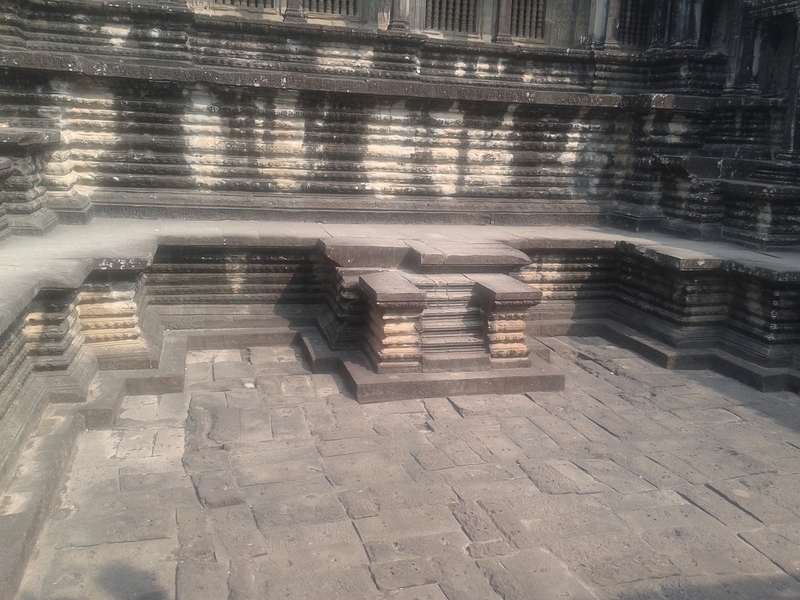 Pic taken Thursday, February 27th 2015, approximately 800 years after it was built. 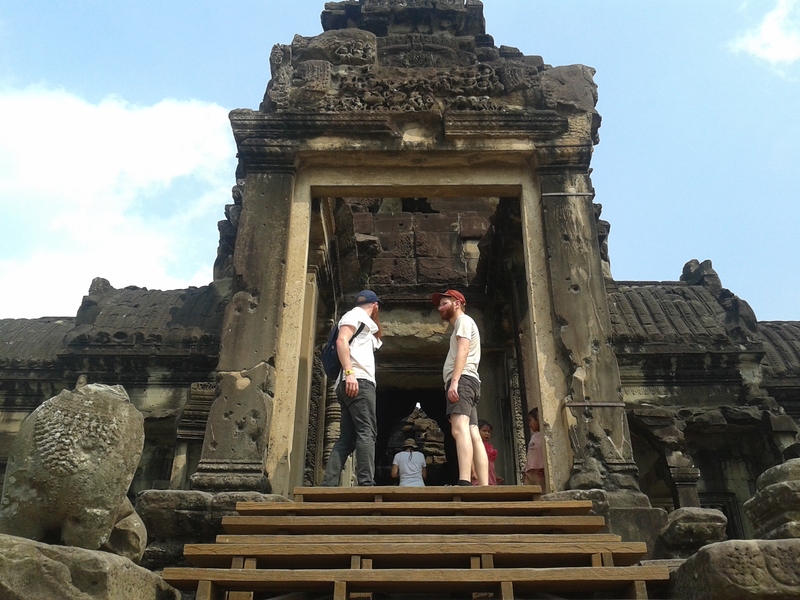 Two of my travel companions under the bullet-hole pockmarked archway entrance of Angkor Wat. We aren’t certain, but after seeing a multitude of places structures similar to this, we figured that – even if it wasn’t true – it would seem quite fitting for this to be full of water. Outside the main city, along the outer rim. Within any multitude of the structures, I could not help but feel the same sense of stony austerity as I’ve always felt in caves, museums and old libraries. 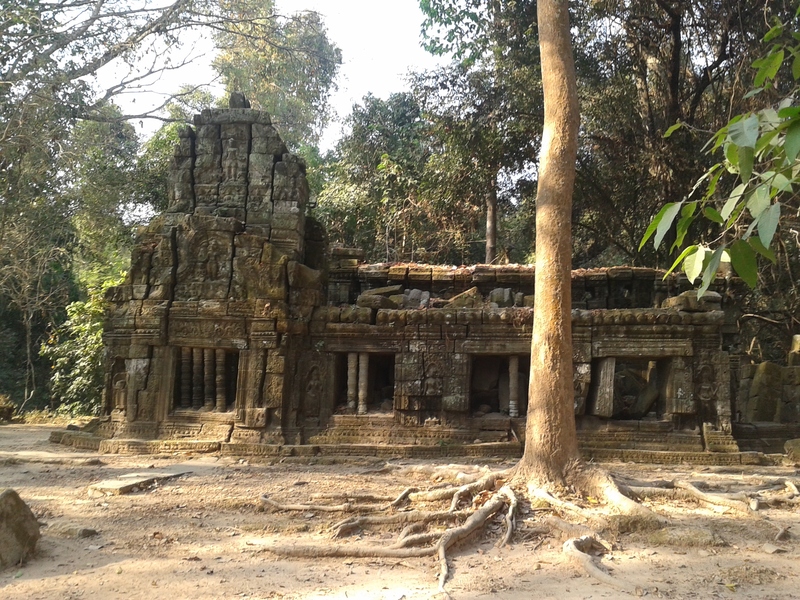 Angkor Thom (lit. “Great/Capital City”) was also built over 800 years ago, but one could feel a different sense of craftmanship in the stone. Throughout my explorations with my friends here, I could not shake thoughts of all the games I’ve played and stories I’ve enjoyed. What I saw was the inspiration for countless temples whose depths I had plumbed for riches and glory, and as I set my feet upon the stone of ages, I found myself looking warily for traps. We even debated on what the colossus would look like from this place, a la Shadow of the Colossus. 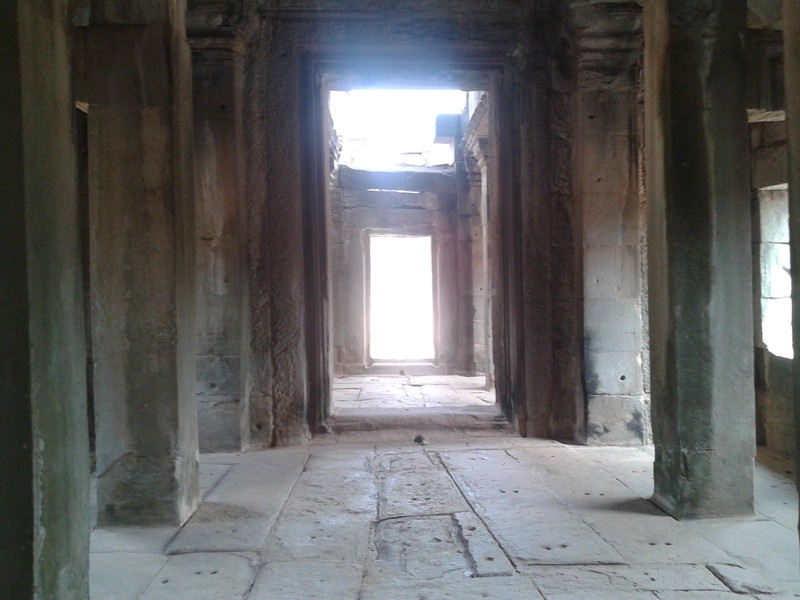 The bloody history witnessed in Phnom Penh inspired awe, the ancient past witnessed in Siem Reap inspired awe as well – but a most different form of the emotion. 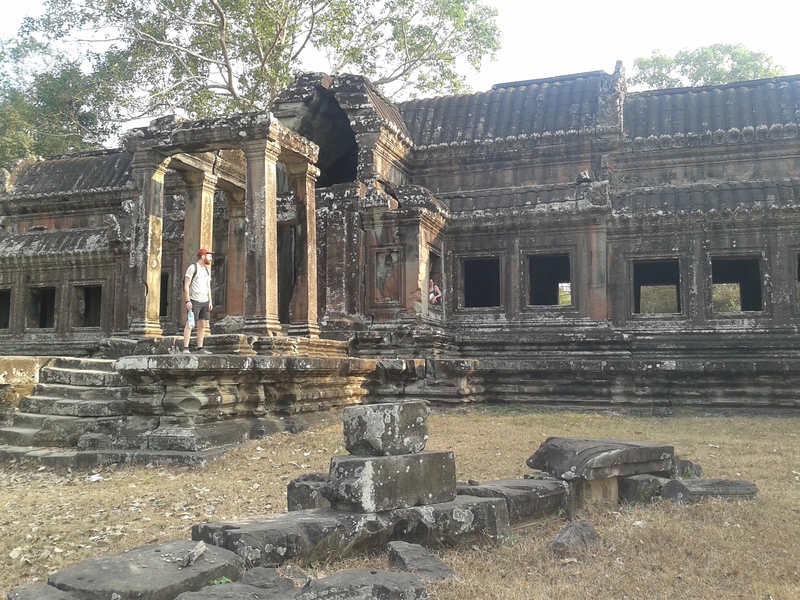 Traveling in Cambodia inspired in me quite the range of emotions, and I have garnered memories from which inspiration for my writing is easily drawn. But beyond that I want to encourage everyone to consider putting Cambodia on their list of places to go. With common sense in action, it is a safe place to be. 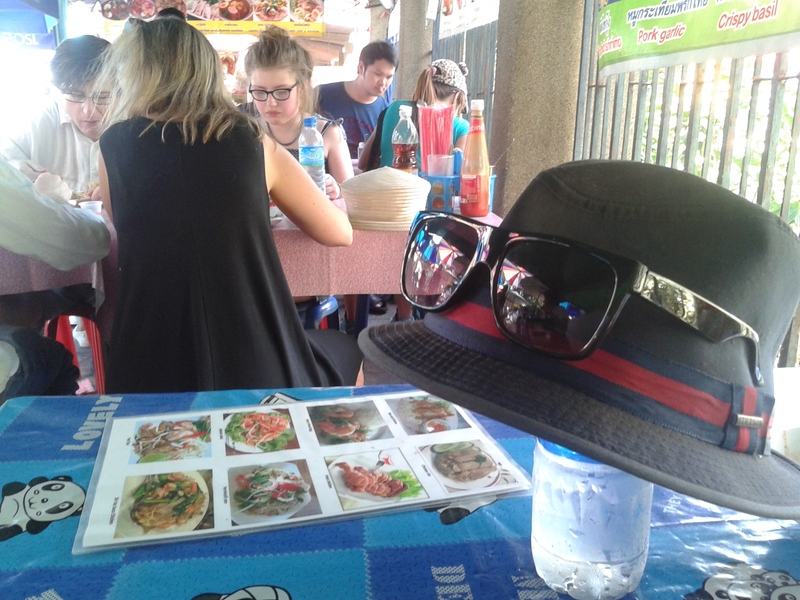 The locals are friendly and $10 will feed you for the day even in the touristy areas. I can very easily dip into the thriftyness and cost effectiveness of this stuff, but I may dedicate a finance-oriented blog post to that sort of thing. This is more about the experience, one I will never forget – both because of the sights I saw, and having shared the sights with the close friends with whom I was traveling. But the place is the American Wild West, like I described in my last post. Caution should be exercised at all times. Tuk-tuk drivers are generally rather pushy, something for which the country is famous. But, more than once, late at night while walking along the street, there were occasionally more overt propositions. One could argue that this is part of the charm. After all, accessibility to this sort of thing, in addition to prostitution and a whole pile of unaccountability is what draws many foreigners to this place. As such a large chunk of the economy is geared toward this, it is a sad thing to see in practice. Yet, whether you are in a group, or traveling solo, I couldn’t recommend anything more than traveling. And you could do worse than Cambodia. The contrast of life is sublime there. In the face of tremendous tragedy, the people fight to better their lives in the best ways that they can. There is a dark underbelly beneath the ruins of ancient civilizations about which much the world has heard nothing. I have returned from quite the journey. This is in part why my posts have been lacking. And, having returned, I have a number of stories to tell from my travels. Living in Sai Gon, Viet Nam, the Lunar New Year (or rather what many other nations know as Chinese New Year) loomed over this country much in the same way Christmas and [Gregorian] New Year’s does over the nation I left behind. 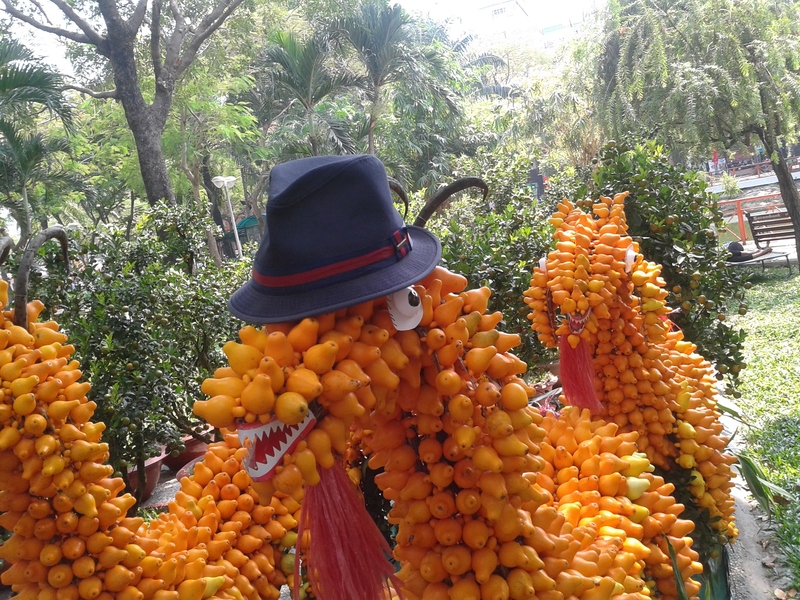 They call it Tet Holiday here, and it is undisputedly the number one event in Viet Nam. As such, many locals take this time to flee the city and return to their hometowns around the country to visit family. Most people have up to one week off, while others sometimes have as much as two. In a city where I’ve met people who work seven days a week with one day off per month, coupled with the layers of tradition that so permeate the culture here, pretty much every aspect of life, many weeks before the holiday, is geared towards the holiday itself. This is what happens when a profound hat-wearer, such as myself, encounters something Tet-Holiday-related that is profoundly in need of a hat. Naturally, foreigners living here such as myself are affected by this, as much of Sai Gon empties of locals during Tet. Most expats are allotted vacation during this time as well, whether they work for official companies or their jobs are a bit more independent – such as in my case, where much of my student base is out of town anyway. Thus, the annual stage is set for vacation for many, and my case was no exception. The plans began with the arrival of four friends flying in from New York, beloved peers I had left behind when I set out from home Ashitaka-style. Fast-forward eight or nine months, and I was waiting at the Tan Son Nhat Airport of Sai Gon after midnight. They landed, made it through customs, and I embraced each of them in turn around 3:00am. 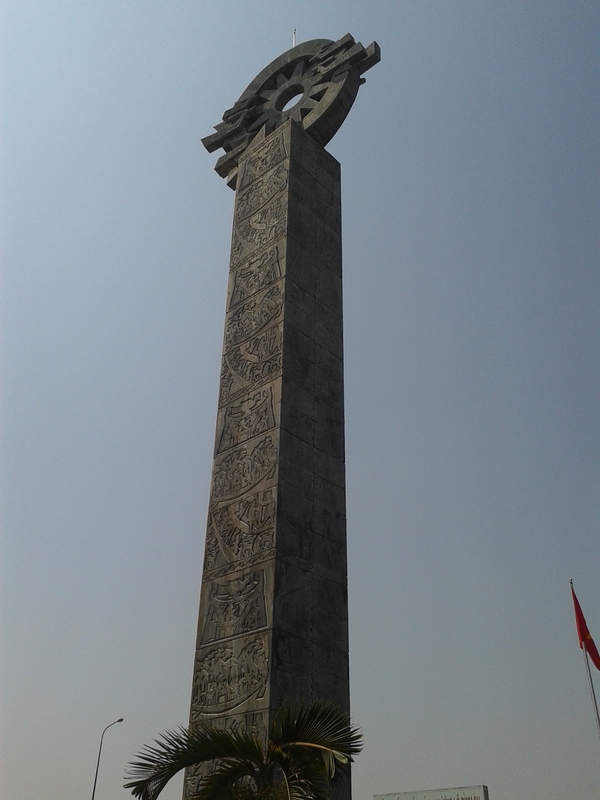 Subsequent days were spent touring Sai Gon, and I was able to show them a few delights of this city I’ve come to love. Vegetarian restaurants, a surprise Cat Café I did not know existed, and the positively divine mango smoothies available. Not to mention the usual landmarks; Ben Thanh Market, the Post Office and mini-Notre Dame, and the usual motley of mad things to be seen in this city that I’ve gotten used to seeing. Mad motorbike traffic, motor-bike taxis sleeping on their bikes in the middle of the day, people cooking food on the street. The cacophony of horns, the occasional smell of sewage drifting up from grates in the street, the glances from locals that are just as often smiles as they are scowls. Boy, I love this town. You wouldn’t guess from its appearance, but a little alleyway filled with cheap blue plastic chairs, located just off Bui Vien Street (the center of the center, in terms of tourists and backpackers), happens to be the best smoothie place in town. 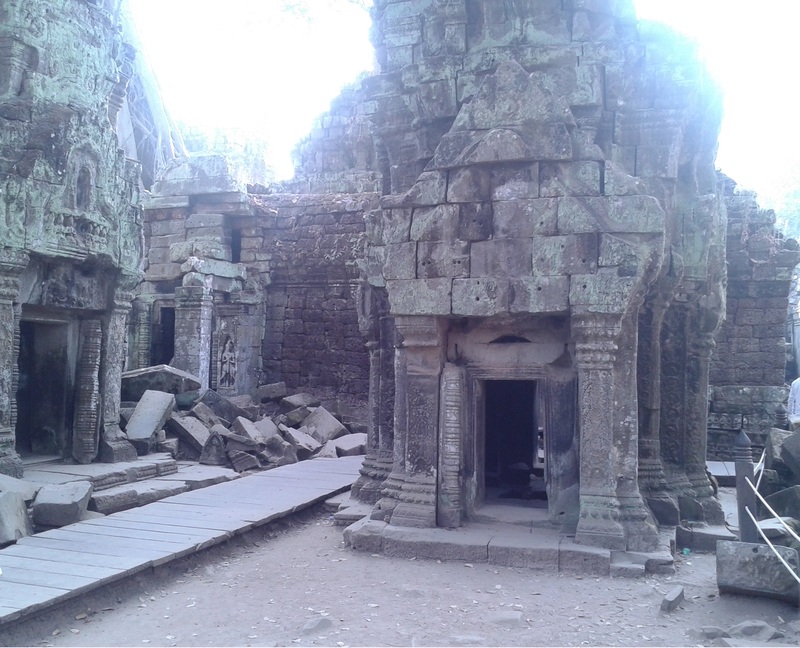 In any case, the real adventure began when we established an itinerary to Cambodia. Having lived in Viet Nam for as long as I did, I actually have done very little traveling. My only understanding of Cambodia was: just some country nearby. I saw it once – passing over it in a plane to Thailand – and getting there was remarkably easy. 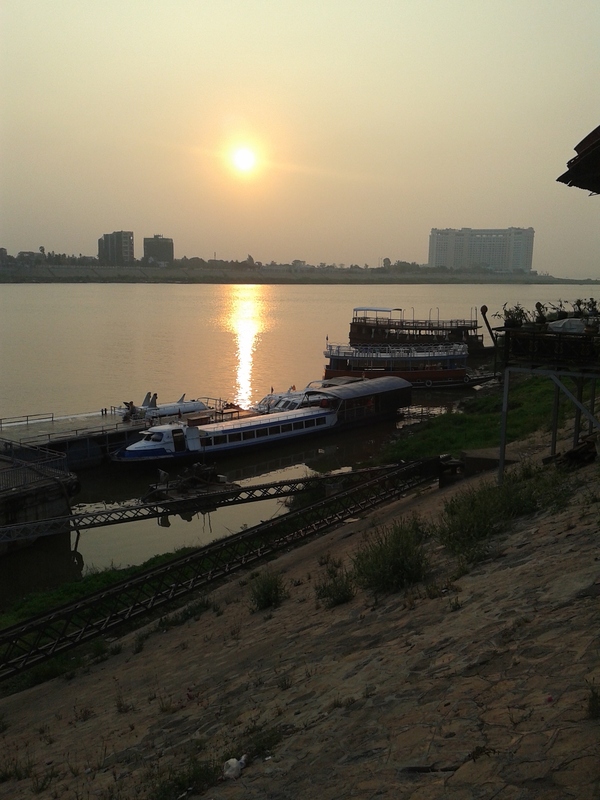 Many foreigners living in Sai Gon, with intentions of extending their stay, make runs to Cambodia to hop over the border and return with a fresh three-month visa, so I had heard about it often enough from them. 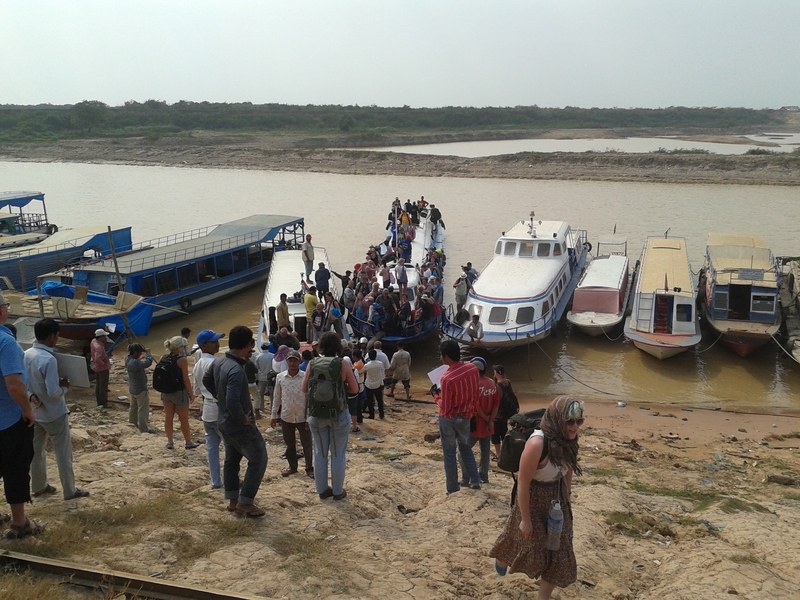 My party and I took a bus from Sai Gon to Phnom Penh, and crossed the border at the Moc Bai gate without incident. Throughout this entire journey, I could remember the words written to me from family many months ago, concerned about my mental health for even mentioning going to Cambodia. For those expatriates seeking to merely renew their Vietnamese tourist visa, the process is simpler and does not even require continuing to the Cambodian capital. 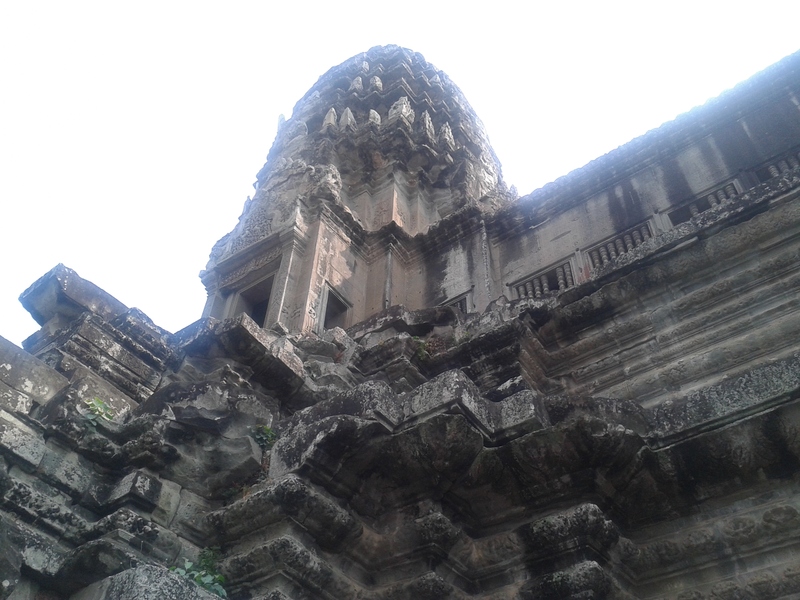 Our goals were different, of course, as the star event of this journey was the fortress temple of Angkor Wat. 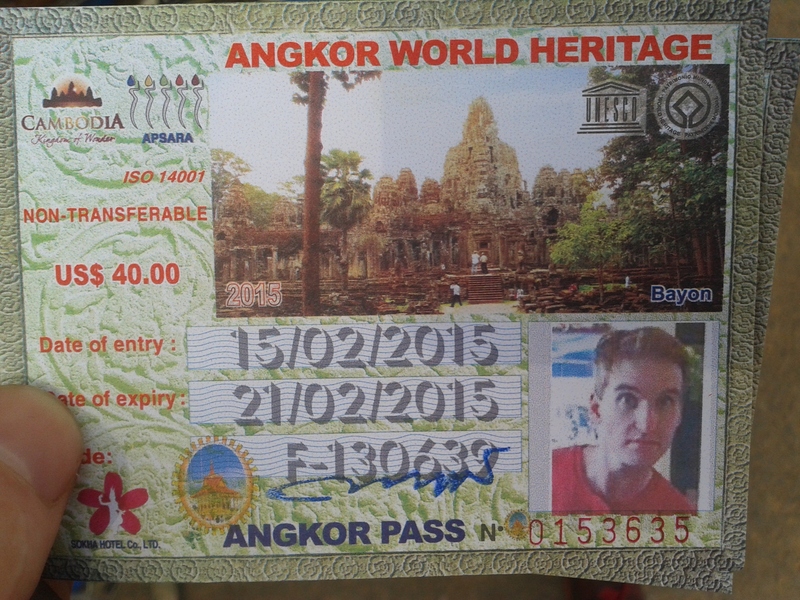 But this post is not about Angkor Wat. Not yet. Nor is this post meant to describe our journey there in any great detail. Not yet. 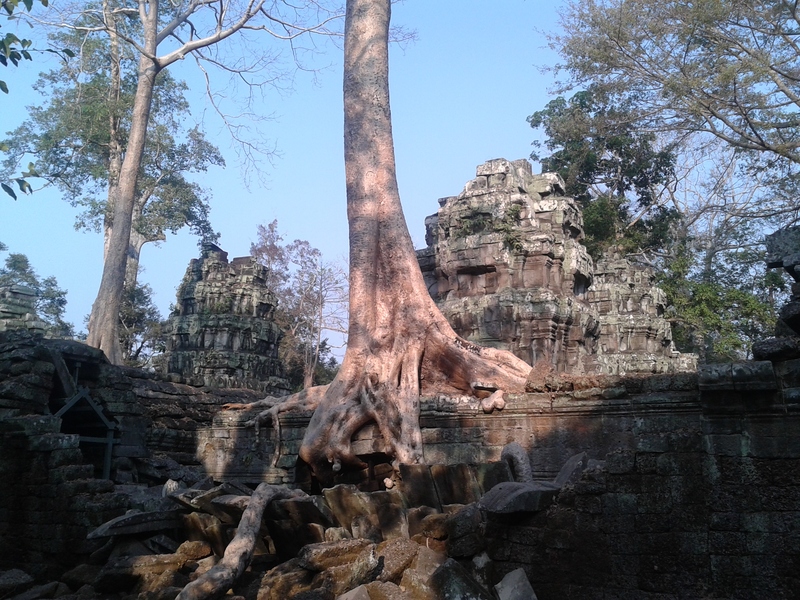 This post is intended to be about Cambodia as a country, and why it’s a place you ought to know more about. There is something universally abhorrent about genocide. But it is also easily written and understood as “a word that means something really bad.” We find it instead easier to focus on matters that directly affect our lives – as opposed to the lives of people on the other side of the planet. This is natural. This is human. Cambodia is a struggling South East Asian country whose recent history is rife with conflict. I don’t claim to be an expert on the histories of the Khmer Empire, or the current monarchy, or the Khmer Rouge himself, but I have read things, seen things, felt things. Those of us from the West most readily associate the word genocide with the Holocaust of World War 2. While it remains a staggering and breath-stealing example of what humans – not aliens, not orcs, not robots; just fellow humans – are capable of, the Holocaust is far from the most recent on such a wide scale. In fact, even to me – a huge fan of the story Maus by Art Spiegelman, and myself a former Jew – feel very little personal connection to the Holocaust. The mists of time have fogged a screen over it, relegating the Holocaust to a historical event from a long time ago. But in the history classes of my so-called education, I don’t think there was a single mentioning of the Khmer Rouge. No one talked about Nelson Mendela or Rwanda, either. I wonder whether the excerpts of these things have appeared in public school history books at all, and I wonder whether I don’t recall mention of them simply because there was no personal connection from me – and thus, I simply forgot. As of this post, I am approaching my 29th year of life on this spinning marble. But I’ve had more life-changing experiences in these last two years than the rest of my life combined. I’ve written about one or two of them. There is a museum in Phnom Penh, the capital of Cambodia, known simply as the Genocide Museum. Most of the touristy hotspot things to see in Phnom Penh revolve around the former dictatorship of the Khmer Rouge; the Genocide Museum, the Killing Fields, things of that nature. I and my party decided that, as visitors of this country, we felt an obligation to see this museum. 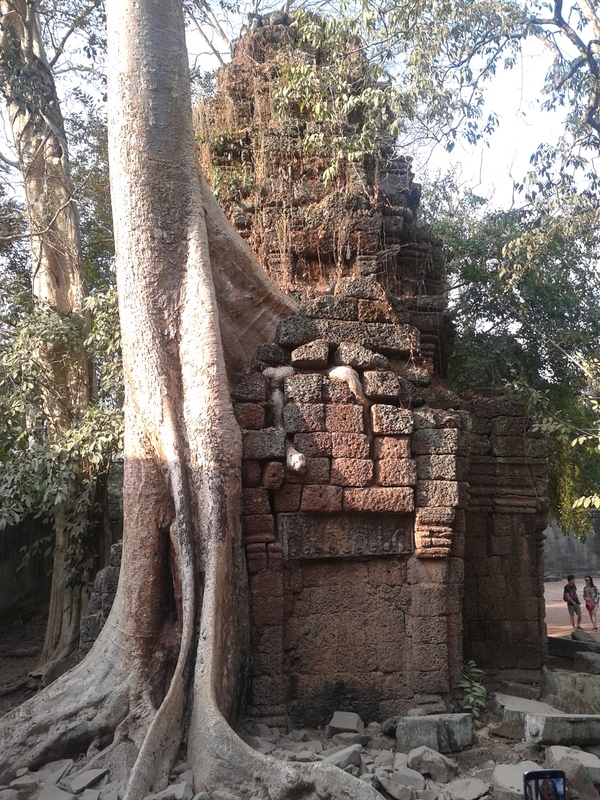 Most tourists came to places like Cambodia to have a good time, and the landmarks of Phnom Penh are far from uplifting – and there was universal agreement that we should expose ourselves to the truth and the bad, rather than keep ourselves wrapped up in tourist bubbles as most people tend to do. To call the museum a tourist attraction would be like calling Auschwitz an amusement park. Long ago, this place was a school for children. Then when the Khmer Rouge took over and commenced his genocide of educated, artistic people (especially targeting those people of certain ethnic persuasions), the school was converted into an interrogation camp. Pay the fee, take your ticket, pass through the gate. The sounds of the city behind us faded as austere silence permeated the courtyard. Birds tweeted, wind rustled the branches of the trees that dotted the concrete walkways. No one spoke among us and my party dispersed about the main square. It took some time for me to organize the mix of emotions and cognitive thoughts swirling in my brain while walking from one room to the next. The rooms themselves were mostly barren, save for an occasional lone bed-frame with a few rusted chains and manacles upon it. Upon the wall of some rooms, a large photo could be seen on display, showing the unidentifiable body of a man or woman who had been subjected to the interrogation. These were pictures taken presumably after the place was stormed and the guards fled. I could see the black and white depiction of a tiled floor — the same tiles upon which I stood upon, gazing at the image — covered in blood. I saw limbs strapped to the bed-frame, a dripping, heavy metal rod nearby. The imagery was the very definition of the term graphic. Other rooms had walls covered in photos of people who died there; mugshots of Cambodian men and women and children, some of them smiling. Display cases bore small piles of “clothes worn by prisoners,” and when walking about the rooms one had to watch one’s step, as there could be found the occasional steel ring hammered into the floor. I can remember feeling my eyes get misty. I can remember hearing other tourists walking and chatting as they passed from room to room. My friends were each affected heavily by this; as it was our second day in Cambodia, but their fifth day in South East Asia. The direct-exposure to poverty on this side of the planet affected everyone, though I know I had gone through that initial shock mothers prior. The museum instilled each of us in turn with strong emotions. One among us found herself so nauseated she had to find a bathroom, where she emptied the contents of her stomach. Another found himself so overwhelmed by what I can only describe as the energy of that place that he had to leave. I didn’t see him go, but I later learned that it took about fifteen minutes for the emotions to overwhelm him before he went to wait for us outside the entrance. I, for one, found myself increasingly worn with each room. There were at least two main buildings, each with five or so floors – I barely got past the ground floor on each building before I couldn’t handle it myself. Human animals. We are all human animals. We waited quietly for the rest of our group, unsure where everyone was at that moment. I sat thinking about whether it was appropriate to break the silence. Eventually I did, expressing that very thought. My companion informed me that while he had been walking, he happened by a group of other tourists. They weren’t nearly as affected as we were. Some even pointed at the photos and laughed. Whether these people were making light of the severity in order to cope with what they were taking in, or they were genuinely insensitive people, I will never know. Regardless, their mere utterance of words in that place seemed taboo to me. There was a time when I wondered whether I was an empath. I used to feel things other people couldn’t – or maybe it was my imagination at work, inventing reasons to feel more special in a world of mundanity. The Genocide Museum (among other places) did not instill me with anything beyond what my cognitive senses brought me. While my friends might have felt them, I certainly didn’t feel any “ghost residue” as I had been half-expecting. No, the Genocide Museum is a place of solemn recollection. Seeing bedframes used for unspeakable tortures, photographs of victims before and after, or passing under trees in the courtyard whose bark probably drank of the blood of those lashed to them … it leaves an impression. And in spite of it all, this recent history, the people of Cambodia struggle on. The people of these various war-torn countries exemplify a resilience such as I can scarcely imagine. I remember walking with Thorneater later that day, and we talked of our experience. Only one word came to describe that afternoon. Awe at what humans — not aliens, not orcs, not robots; just fellow humans — can do. And what they, for whatever reasons or under whatever pretexts, they cannot feel. And yet I’m increasingly convinced that people are inherently good. We are all just animals, this I heartily believe, but when men, women and children from countries that suffered atrocities of immeasurable horror can be so open and welcoming to strangers, it gives a sense of hope such as I’ve never really felt back in New York. I decided before, and though brief homesickness and life obstacles shook me once or twice, that I can’t go back and leave this all behind.